The movie about an ex-Civil War soldier who is mysteriously transported to Mars shows audiences an extra long peek at the epic film about reuniting a torn planet. John Carter is just an average confederate soldier living in the post Civil War era. He’s trying to make ends meet and keep away from his enemies, the Union soldiers. When he finds a special artifact and is mysteriously transported to Mars by inexplicable means, he realizes he’s in for a different kind of war. The title character is played by the 30-year-old Taylor Kitsch, the biceped beauty from Canada that you might remember from X-Men Origins: Wolverine and Friday Night Lights. Carter’s fate once he arrives on this alien planet is yet to be determined, but we do know one thing, he’s not alone. The planet has many nations among its people and the leaders of those nations, much like those on Earth, are not on the best of terms. Carter soon finds out that two nations are involved in a violent conflict. Their leaders, Tars Tarkas (played by Willem Dafoe, our favorite Spider-Man villain you all know as the Green Goblin) and Princess Dejah Thoris (played by Lynn Collins, also of X-Men Origins: Wolverine, holla!) are the worst of enemies. Based on the epic 11-volume series by Edgar Rice Burroughs, the film boasts a wild ride to a new planet with a faithful hero that will do whatever it takes to save the people from tyranny. Typically, previews of such films are only two and a half minutes long, but for this sci-fi action adventure, Disney has released a special 10-minute sequence for fans to get a taste of what is to come. 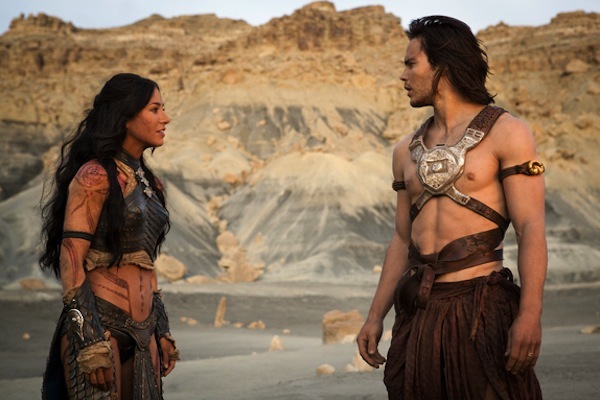 In this sneak peek, audiences get a glimpse of the life John Carter has on Earth… before he’s transported into space. John Carter releases in theaters March 9 and co-stars Samantha Morton, Thomas Haden Church and Mark Strong.